Are you in the mood for winter yet? I'm not quite - we've actually been having some amazing fall weather here in Calgary . . . 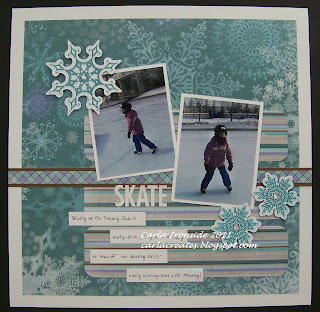 BUT I am loving the new winter themed line from CTMH called "Wonderland"! Gorgeous!! Don't you love the snowflake embellishments? They were cut with the Art Philosophy Cricut cartridge and then stamped with a coordinating stamp set! LOVE!!! So easy! Wonderful "Wonderland" layout! :) I had seen this sketch a few days ago. You executed it perfectly!